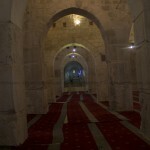 Al- Marwani Mosque lies at the bottom of the south-eastern corner of Al-Aqsa Mosque. Previously it was known as the East Settlement. It consists of sixteen arcades and it has an area of more than four acres. Al-Marwani Mosque located under the south-eastern yardsof Al-Aqsa. Its southern and eastern walls are linked to the walls of Al-Aqsa Mosque and they are also the walls of the old city of Jerusalem. This part of Al-Aqsa Mosque as the eastern settlement. 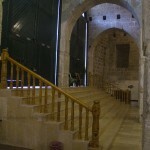 It was built by the Ummayads as an architectural settlement for the original Bait Ul-Maqdis knoll sloping to the south, in order to have the ability to build over its southern side, the closest to Qibla, on a flat ground and solid foundations that rise to the level of the northern section. 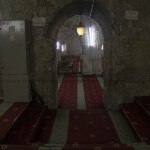 It is most probable that this mosque was built before Al-Qibli Mosque, for that reason, and it was used for prayers until the other mosque was built. 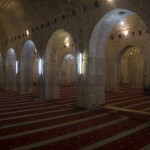 The mosque includes 16 stone arcades based on strong stone pillars. It has an area of 4.5 acres (1 acre = 1000 square meter). It is considered as the largest roofed space in Al-Aqsa Mosque now. 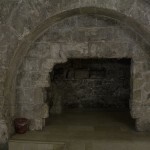 It can be reached through a stone ladder located in the north-east of Al-Qibli Mosque, or through its northern huge gates that are orthogonal on the eastern wall of Al-Aqsa Mosque which had been recently discovered. 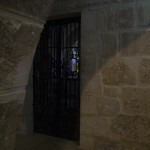 During the crusaider occupation of Jerusalem, the occupiers turned it into a stable for their horses and a store for ammution, and they called it “Solomon Stable’s”. It is still possible to see the rings that they carved in the pillars of this ancient mosque to tie their horses. After liberating Bait Al-Maqdis (Jerusalem), Salah Al- Din Al-Ayyuobi re-purified it and then closed it. 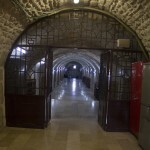 (Mistake) Al Aqsa Association for Waqf and Heritage in Jerusalem rehabilate it and opned it for prayers, in November 1996 AD – 1417 Hijri, in order to protect it from a plan which enables jews to pray in it and then take it, as they established stairs that lead to it throught the closed Tripartite Gate in the southern wall of Al-Aqsa Mosque. This work was considered the largest constructional plan in Al-Aqsa Mosque since hundrends of years. The success of Muslims in opening two of the huge northern gates of Al-Marwani Mosque, in May 2000, in addition to building huge stairs that lead to these gates in a short period of time, exasperated the occupatiom authority that was planning to control the area. In 28/9/2000, Ariel Sharon, the leader of the Zionist opposition, broke into and defiled Al-Aqsa Mosque and attempted to reach Al-Marwani Mosque. This incident ws the outbreak of Al-Aqsa Intifada in the next day. 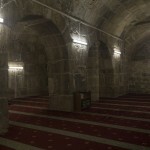 A number of pillars in Al-Marwani Mosque are defected, especially in its last arcade adjacent to the eastern wall of Al-Aqsa Mosque. Moreover, its roof has serious cracks which might cause it to collapse as a result of accumulation of sedments of dirt and dust due to humidity. 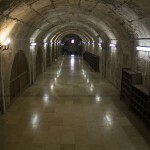 This requires urgent restoration which is prohibited by the occupiers as a part of the ongoing siege of Al-Aqsa Mosque.